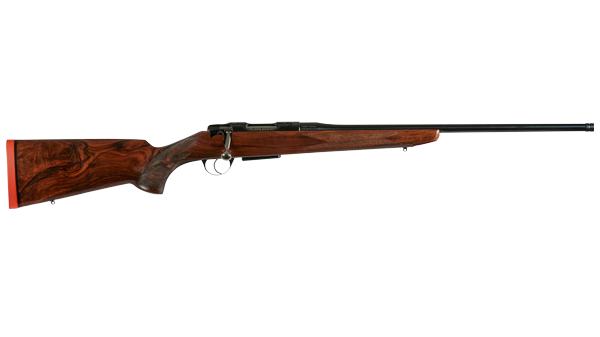 Compact and light, but at the same time an extremely precise and stable rifle. The Legacy is a pleasure to shoot with and the ultimate companion. Perfect for those who have a special need for a rifle for pest control and smaller deer species where these calibres are legal. The rifle‘s short and compact construction and low weight gives the shooter more energy to concentrate on the important things – namely, to be observant and constantly ready to provide a safe and accurate shot when the opportunity arises. The elegant lines of the Schultz and Larsen Legacy are complimented by a rosewood forearm tip and matching grip cap. Wood upgrades are available from Grade 2 through to Grade 6 Exhibition, all with a linseed oil finish to enhance the figure and beauty of the wood.The Legacy is available in Right or Left hand. The Legacy is slim, light and deadly accurate. 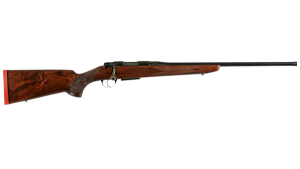 This is the rifle for the popular .222 Rem and .223 Rem calibres and 300 Blackout. Weighing in at just 2.8 kg with a barrel length of 53.5cm and a magazine capacity of 4 + 1. Barrels come standard with a 1/2×20 UNF thread. The top of the action accepts the strong and lightweight Schultz & Larsen all steel scope mounts, available in a range of diameters and heights. The action is drilled and tapped for those who wish to use an alternative mount. Just like other rifles in the Schultz & Larsen family, the Legacy has a switch barrel system allowing the barrel to be changed for any other in its calibre group with just a simple wrench. The same bolt is used with all Legacy calibres. Due to the smaller diameter action, Classic and Victory barrels do not interchange and only barrels designed specifically for the Legacy can be used. Barrel Diameter, Length & Twist Rate Choose an option14mm, 56cm, 10"14mm, 56cm, 8"18mm, 45cm, 7½"18mm, 56cm, 10"18mm, 56cm, 12"18mm, 56cm, 8"